Cades Cove, Townsend, Tennessee • United States My friend took me to Cades Cove to see if our luck in search for fall colors would change for the better here. 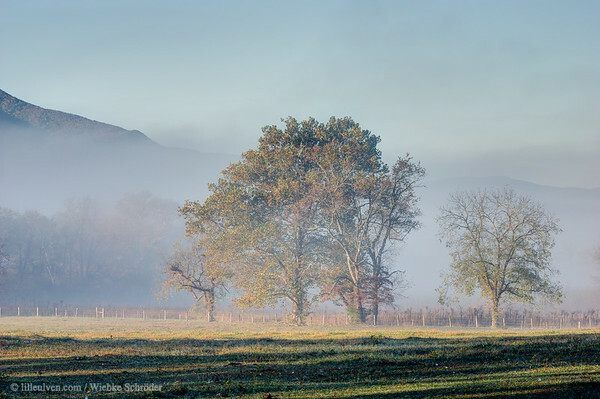 We also were considering to take a ride on our bikes, but soon found that too many visitors had the idea of visiting Cades Cove as early as we did...So no bike ride but some nice fog photos. uuid="C28812BD-A935-420F-AED0-22FCE3C0F408" id="United States of America lilleulven.com _K3_3274_HDR.tif HDR Lilleulven.com"